A new study found that the more expert the skier or snowboarder, the more likely they were to have sports travel insurance. One in four skiers and snowboarders planning to hit the slopes this winter will be going on a winter sports holiday for the first time. While 60% of these first-timers want to be in good shape for their winter break, as they intend to do more exercise before they leave, only 40% are concerned about protection and have sports travel insurance, a study by ICM found. The research found a direct correlation between experience and those who bought insurance, as the more expert the skier or snowboarder, the more likely they are to have sport travel insurance. Of those with insurance, 62% considered themselves to be at an intermediate level, and 70% said they were experts in their sport. 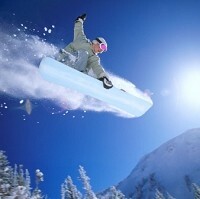 Among all snow sport enthusiasts-beginners to experts, 37% polled have not taken out winter sports travel insurance. One in four of this group said they had no intention of taking out insurance cover before going on holiday, while 17% remain undecided about purchasing it or not. Opportunities for UK snow enthusiasts to practice skiing and snowboarding are available thanks to artificial or dry slopes. Of the 89% who said they had used these slopes in the year, 38% will go on them again to practice their sport before they go on holiday, with 15% saying they plan to go one time each month, and 6% intend to practice once every week.